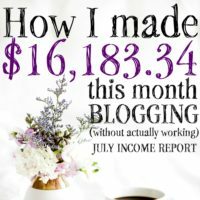 August 2016 Blogging Income Report. So, I spent August trying to catch up from my month off in July. It wasn’t my best month ever. I fell behind and rushed the whole month when usually I batch blog so I’m always working 1-2 months ahead. So, lesson learned: I may have outgrown my months off. If you’re trying to figure out if/how to hire help for your blog- I detailed how I did it here. 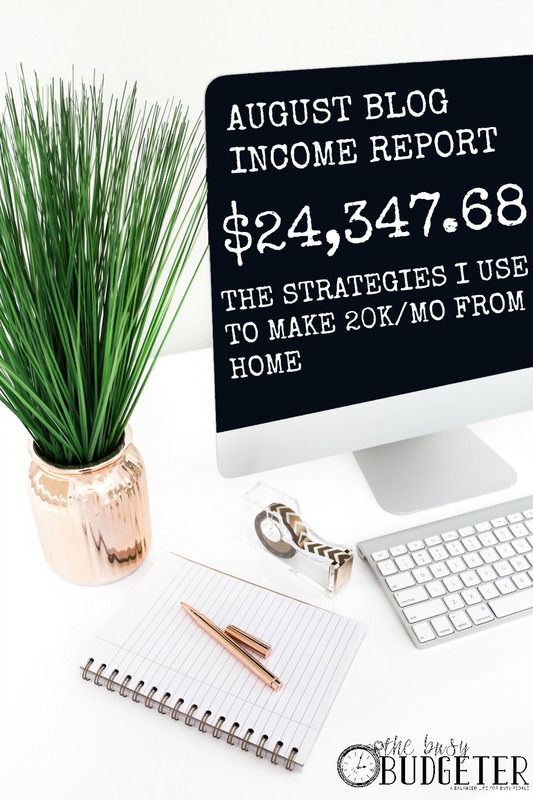 Why post an income report? 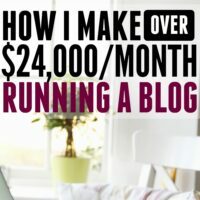 If you’re wondering why I post a blog income report, it’s because this journey was only made possible by other bloggers posting their blog income reports and inspiring me to give it a shot on my own. This is kind of my way of “paying it forward”. Plus, I love the fact that I work in the only industry where it’s totally normal to post your income every month. 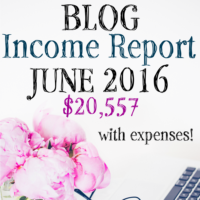 If you are a blogger or end up being a blogger, I would love to see you post your blog income report too! You can actually link to them in the comments below. August was a blur of task lists for me. It wasn’t as organized as my months usually are since, for the first time since implementing batch blogging, I wasn’t always working ahead. I went to Focused Blogging Conference in August, as well, and was thrilled with it. I can’t recommend it enough. I got a chance to meet Lauren Greutman from I Am That Lady (and get a copy of her book, The Recovering Spender, which is AMAZING) since she was the keynote speaker. Focused stands apart because they make you implement what you learn right there. So, they only have a few sessions, but after you learn about the topic, you spend time with the instructors who help you implement what you learned. Kelli and Crystal from Learned To Blog taught a session on Google Analytics and SEO that led to late nights discussing how to implement a foundational understanding of analytics, webmaster tools, and SEO in a way that even I can understand. They stood up in front of the class and said “we teach in actions steps!” and my heart swooned. 🙂 As a success story of Elite Blog Academy, (which isn’t available right now but you can join the waiting list here), I know exactly how profitable it is to learn from someone that teaches in actions steps and not theory. Plus, from just the 30 minutes of implementation, we did in their class, my bounce rate decreased by over 1% immediately! (which means, more pageviews). Since SEO is on my fourth quarter goals, I created a very small SEO Intensive (like a mastermind group). We’re focused on going through each of their courses starting with analytics, then webmaster tools, and finally the SEO Course. Our goal is to be finished in 90 days and to have significant results in 6 months, at which time I’ll make sure to update you. Want to start your own group to do the same? You can start with Skyrocket which is their action step book that teaches you Google Analytics here. We’re doing 30 days of SKYrocket, 30 days of Dominate and then 30 Days of the SEO Course. If that sounds like something you want to do, I can help you make that a reality with step-by-step instructions (for free!). You can find instructions for how to start your own blog here (even if you aren’t great with computers). All in all, it was a solid month for income, but not my best month for organization. I was able to keep up this month within my 20 hour work weeks, but not actually get as far ahead as I like, but having full-time help in September should make that an easy goal to reach. Because I’ve stopped coaching, I released my Pinterest Strategy Guide in PDF form to you. Which means that you can spend a fraction of the price that coaching costs and get my step-by-step Pinterest Strategy Guide direct in your inbox right now. 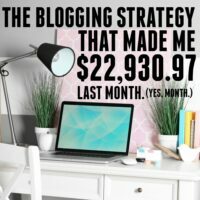 The Pinterest Strategy Guide will walk you step by step through implementing the Pinterest Strategy that brought me from $18/month to over $20,000/month. You can get it here. Complete the Core Affiliate Strategy Guide: Done! You can buy it here! Like the Pinterest Strategy Guide, the goal of this product is to give you easy-to-follow (and quick) action steps to completely implement the strategy that I use for affiliates. It’s only a few pages and walks you step by step through my entire strategy. I routinely make more than 10k a month in affiliates and this is a common question that I get. You can see the strategy here. Expand my virtual assistant’s position into a full-time job. Done! She starts the second week in September and I’m already restructuring everything to make for a seamless transition. Moment: Like Rescuetime, which tracks how much time I spend on my computer and how productive those hours are, Moment tracks how much time I spend on my phone and on what apps. Productivity is highly important to me because of the condensed hours I work. Moment reminds me to stay off my phone and stay focused on my work during work hours. My goal is to finish my work day with less than 20 minutes spent on my phone. The app is free and I would LOVE for you to comment below with how many hours you spend on your phone in a day if you use it! Taking the month off. Huge fail. I wish I had just worked an hour a day instead of taking it off completely! But, lesson learned and now I know. Instagram: I learned about Instagram growth strategy from Clarissa Hooper at Focused and while her information was fantastic and solid, I also realized that for right now, Instagram isn’t my best bet and I need to focus on areas of higher ROI. So I’ve abandoned growth strategy for Instagram for this year. After I have an SEO strategy in place, I’ll revisit it. But I’ll still use it personally, so if you’re desperate to see selfies and random life photos, you know where to find me. Get back to batch blogging. My goal is to be at least a month ahead by the end of September. Because man, do I miss my batch blogging schedule! I want to stay on-task and complete the SEO intensive as we outlined, which should be easy since I have the others in the group to hold me accountable. I focus most of my sponsored post efforts on reaching out to brands that I use and love and offering a sponsored post package at a rate that’s a little lower than “industry standard” (which is highly debatable). That lets me increase the “yes!” emails I get in response and ensures that I can count on making a certain amount every month on sponsored posts while still being really picky about which brands that I’ll work with. I also go through each of my brand networks (places like Tapinfluence and Clever Girls) to see if there are any assignments that would be a good fit for my blog. I increase my pageviews by marketing my blog content through Pinterest. I a/b tested everything on Pinterest for about 6 months until I figured out a system that works for me. My favorite thing about Pinterest (at least with BoardBooster) is that I spent only 4 hours a month running my Pinterest Strategy. That leaves me tons of time to grow in other areas. You can get a copy of my Pinterest Strategy Guide here which teaches you my system step by step. I focus on a core group of affiliates that I think almost everyone in my target audience should be using. Since I run a budgeting website, I factor cost into the equation. If something is a great product but is too expensive for my readers, I likely won’t add them to the core affiliates list. Having the core list lets me easily track special sale dates that my readers shouldn’t miss and lets me focus without getting overwhelmed with the barrage of affiliate “offers’ hitting my inbox daily. To me, the key to affiliate marketing is to never ever promote anything that you haven’t used yourself and you don’t love. My philosophy is that if you only promote companies and products that you would tell your best friend about enthusiastically, then you’re doing it right. You can get the step-by-step action steps needed to implement my Core Affiliate Strategy here. I just posted my August report and am so excited that I got my Amazon affiliate money up to the highest point in one month. It’s not a ton of money, but it’s growing! I just want to hug you through the computer 🙂 I’m so overwhelmed with monetizing my blog and came across your blog somehow tonight. This is very motivating (although a bit frustrating on my end since I know I’m not taking advantage of monetizing). My blog has pretty good stats (55,000 pageviews/mo) with little, if any, marketing. Just downloaded your quick growth resource guide which was very helpful. Stick with it! You can totally do this! The beginning is hard, really hard. Once you get through that you will not believe the difference! Love reading your income reports. So inspiring. Thank you for linking up with us at #HomeMattersParty .See you again next week.